We offer professional flat removal of Africanized honey bees. When dealing with Africanized bees, safety is always a major concern. Africanized honey bees and European honey bees are almost impossible to tell apart until they have established a hive. Never try and treat bees yourself as it could have devastating consequences not only you but your neighbors, family, and pets. Africanized honey bees in the central Arizona and Phoenix area are a great deal more aggressive than your average European Honey Bees and can become very dangerous if not properly dealt with. Africanized honey bees are still beneficial to the environment no matter how aggressive towards intruders they are. In some cases, the bees can be captured, relocated and re-queened to produce a much less aggressive honey bee. It's hard to decipher if feral bee swarms are going to be aggressive or not and this becomes a problem for beekeepers. Due to tight quarter housing and highly populated areas, capturing and relocating an established Africanized bee colony within the city just can't be done due to safety concerns. This means the bees have to be treated in a way so that you or any of your neighbors or pets get attacked by the bees or injured running away during the treatment. Phoenix Bee Removal has the capabilities and skills needed to provide a safe and effective treatment to deal with Africanized Bees without anyone being injured or stung. We cannot emphasize enough on how dangerous treating an established Africanized bee hive is. Africanized honey bees will defend their home and the sheer number of bees they send out to do so can be in the thousands. Don't fall for the scare tactics and think an Africanized bee colony that has just arrived is looking to hurt someone. There is no way to tell if a migrating swarm is Africanized or not until they become established. Same rules apply almost all bee encounters in Arizona. Stay clear of the bees and give us a call to get some professional advice on what steps should be taken to keep you safe. If you have a hive on your property and are not sure how long they have been there. This is where it becomes much more dangerous and can lead to an unprovoked attack on an unsuspecting victim. If the bees were there before you noticed them and didn't hurt anyone there is no need to panic just stay away and give us a call and we can give advice on what steps you should take to have the hive removed or the bees treated. Bees improperly treated with stuff bought at their local hardware store or diy pest control store, can, and has, lead to dozens of injuries and sometimes even death every year in Phoenix and around Arizona. Never try to treat an active hive with over the counter products and also never try and seal the bees in with foam. Both of these just lead to a lot of wasted money and a huge mess. Bees that are blocked into a void of a wall or attic space with no outside exit can end up inside the house. Thousands of bees can end up inside of your home if you trap bees in. We see it dozens of times a year over and over. Please call a professional for advice when dealing with any feral honey bee swarms or established hives. Trying to treat bees yourself or sealing them in with a can of foam is dangerous and can lead to injuries and an even bigger problem. Stay away from the bees!! Keep kids, pets, landscaper's, maintenance men and anyone else away from the bees. Certain smells or sounds can send the bees into a defensive mode and Africanized bees will attack in large numbers. Most pest control companies are not properly trained on how to deal with Africanized bees and may attempt to control bees using improper techniques. This can drive bees deeper into your home and just have them start back up in a couple weeks. Bee Removal at an affordable price with a guarantee you can count on! A majority of bee swarms that land in trees do not need to be removed or relocated. Tampering with the swarm will cause the bees unnecessary stress and may inadvertently cause the bees to stick around longer or to split up and cause confusion making a problem where there shouldn't have been one. 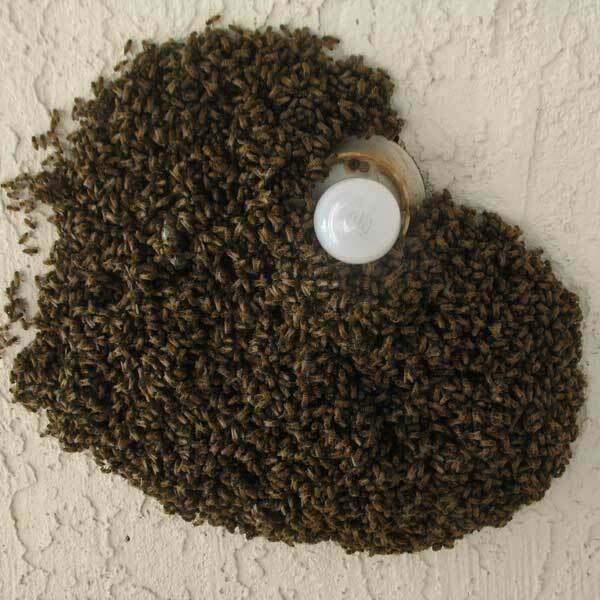 Bee swarms will normally leave within 72 hours but often only stick around for a short time depending on the weather. While the bees are migrating they are extremely docile and for the most part harmless as long as they are left alone. Migrating honey bee swarms often stop to rest up in trees when they are on the way to find a new place to call home. The tree has become a hotel for the bees to stay in while they are migrating to look for a new home. The swarm will stop and gather around the queen forming a large mass of bees that will look like a ball and is often mistaken for an active beehive. The bees will then rest up and send out scout bees to search for food and water and a possible new place to call home. Most bee swarms will only hang out for a few hours and be on their way. Honeybee swarms have a completely different temperament than an established bee colony. If you have just noticed a bee swarm on a tree branch, bush or shrub around your house. 90% of the time they are just resting up and will be moving along shortly. They are just on their way to find a new home and need some time and rest to do so. Bee swarms in Arizona are not the same as the swarms in the Mid-West and Far Eastern states in the U.S., bees travel a lot further when migrating in Arizona compared to some of the Eastern states. Bees start sending out swarms in Phoenix around the beginning of March and continue thru November. The heaviest times are normally March thru June depending on the weather in central Arizona. Swarms, for the most part, are not aggressive when left alone. A majority of the time it is not necessary to have a swarm removed or killed. Simply leaving them alone and letting them do their thing will save not only the bees but save you some money as well. Companies like to take advantage of the swarming season and like to use fear to crank up their prices. The most common practice is simply to say they are Africanized and they will attack anyone and everyone around. That is simply not true of all migrating bee swarms in Arizona. There is no way to tell with the naked eye whether or not bees are Africanized or European or a hybrid and to what extent. The aggressive behavior is the only clear indicator whether or not a feral hive is Africanized or not. This is why all feral bee colonies should be treated the same in regards to safety and should only be handled by a professional to make sure everyone stays safe. We've all seen the stories in the media about someone being attacked by a swarm of bees. This causes a lot of confusion between migrating swarms and established bee colonies. These attacks happen when established bee colonies have been disturbed. Usually by someone who went off trail hiking or just someone doing yard work using power tools. The most common way is by people trying to treat the bees themselves. Migrating bee swarms are not as dangerous as they are made out to be by the media with their fear-inducing stories. Just stay calm and call us and get some information from a professional about your situation. Should I Have The Swarm Captured? The short answer is no. Capturing and relocating a bee swarm will cause a lot of stress for the bees and most will not make the relocation alive. Letting the bees move on naturally will cause them the least amount of stress and ensure they have a safe journey to their new home. When bees start to swarm they like to land in trees to rest up and wait for orders from the Queen on where and when to go. This often looks like a giant basketball size of bees which is quite often mistaken for an active hive. A honey bee swarm can consist of thousand's of bee's and be very intimidating when they arrive as well as when they leave. It all happens within minutes. What should I do if I have a Swarm in my tree? If possible leave them alone for 24 to 72 hours and they will fly away on their own. Keep an eye on your property to make sure they don't move into or on any structures. The Queen has just decided to rest up for a bit and your tree has become a motel for a few hours or even days. This does not mean that the bees will move into your home or even your neighbors home. If the bees decide to stay longer than 4 days they need be removed. When should a bee swarm be removed? If they land on the structure of your home and there is visible honeycomb then they do need to be treated or removed. If you have a swarm on your property and are concerned someone might antagonize the bees or that the bees might be a danger to the public then give us a call and we will talk you through your options to getting your problem resolved. Save yourself some money and save some bees at the same time. Don't be another victim unnecessary pest control, outrageous prices and scare tactics. Pass on the message that not all bee swarms need to be removed and not all the bees in Arizona are Africanized or "killer bees".